Well, the easiest way to explain is by showing, so that’s what I’m going to do here. Let’s create a simple application from scratch with two buttons: one to update Skype for Business status to Busy and one to update it to Available. 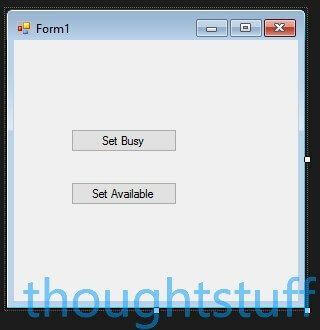 I’m going to use a Windows Forms Application for this, but you could just as easily create a WPF application or a Console application. (unfortunately not yet a UWP application). Well, that’s the UI sorted! 😉 Now, before we can write any Skype for Business-specific code we need to add a reference to the Lync 2013 Client SDK. Skype for Business vs Lync 2013: It’s confusing, but there is no Skype for Business Client SDK. However, the Lync 2013 Client SDK works just fine with the latest Skype for Business client. Over time the client will add new features which the SDK won’t know about and there will likely be a feature drift, but for today key functionality remains supported using the Lync 2013 Client SDK. However…it’s not totally plain-sailing. When you run the installer it will complain that Lync 2013 isn’t installed. You have three options. Either uninstall the Skype for Business client, install the Lync 2013 client, install the SDK, then upgrade the client to the Skype for Business one. Secondly, copy the Microsoft.Lync.Model.dll file from another computer which does have the Lync 2013 client installed and reference it in your project. If you’re feeling adventurous however you could also probably extract the setup.exe package and pick out the DLLs from the installer. Having done that, add a reference to the SDK in your project by right-clicking the References branch in the Solution Explorer and choose Add Reference. Navigate to C:\Program Files\Microsoft Office\Office15\LyncSDK\Assemblies and add a reference to Microsoft.Lync.Model.dll. We’re ready to write the code to change presence. Our two buttons do similar things, in that they change presence. Therefore, we’ll create a single function which takes the intended presence state as an argument. I’m going to use the Enum which the SDK uses to represent presence because it’s easier! Actually updating the presence is done by creating a Dictionary of new information about yourself which you then ‘publish’ to the SDK. Each entry in the dictionary is one of the values in the PublishableContactInformationType enum. You can add as many items into the dictionary as you wish – we’re only going to add one, called Availability, which represents the presence. And if you’re new to ThoughtStuff, welcome! A great place to start is the Start Here page which introduces you to everything I have to offer you to help you be awesome at Skype for Business Development. I think you also need Visual Studio 2010 to install the 2013 client sdk, so we just install the VS2010 shell on our build server images (http://www.microsoft.com/en-gb/download/details.aspx?id=1366). The lync 2013 basic client (https://www.microsoft.com/en-gb/download/details.aspx?id=35451) can also be installed side by side with the full sfb client if that helps getting up and running quickly.